Of the approximately 600 BoatUS towboats in the United States, all are red — except for one pink one. When Capt. Brian Williams of TowBoatUS Detroit wanted to do something for his mother, he picked up a can of pink paint. The matriarch of the Williams family was diagnosed with breast cancer in 2006. After a brave battle, she died two years later. Williams decided to do something for her, painting his formerly red towboat pink and changing her name to Hope in an effort to create awareness of the disease and encourage funding for medical research. Williams said he is donating a portion of the revenue the boat earns this season as it patrols the Detroit River assisting boaters in need. "I call it towing for a cure," Williams said in a statement. "It&apos;s our way to say we are here for those suffering from this monster. We want to help rid the world of cancer." Reactions have been positive, he says. 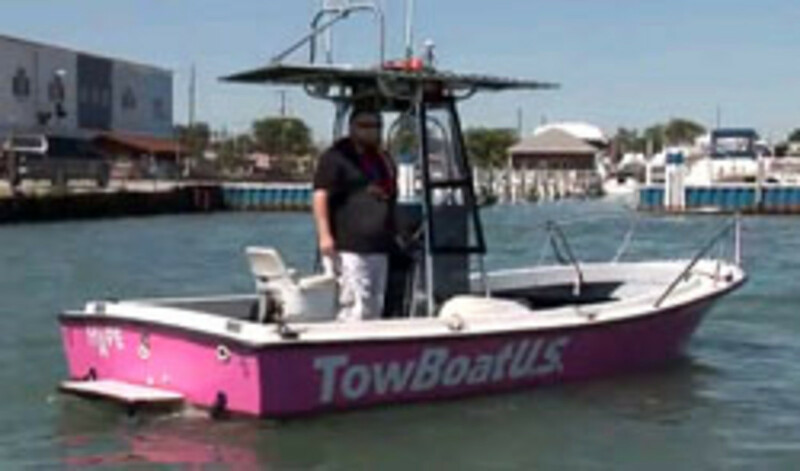 "No one has ever seen a pink towboat — this is the only one in the BoatUS nationwide fleet." The disease also affects Williams&apos; primary captain of the boat — whose mother also has breast cancer. "Breast cancer affects so many lives," Williams added. On some days, Detroit area boaters will see one of Williams’ female captains at the helm of Hope. "I appreciate the significance of that. I&apos;ve got a great crew of captains."